Yesterday I posted the first in a series, on my epic journey through Foodie Heaven. I mean…the San Francisco Ferry Plaza Farmers Market. I have to admit I really have a thing for dairy. I don’t drink, so I’d make a terrible wine connoisseur, but I love cheese. I’ve tried to give it up on a few occasions, but the creamy, or nutty, or melty siren song of a lovingly prepared and ripened or aged cheese calls me back. 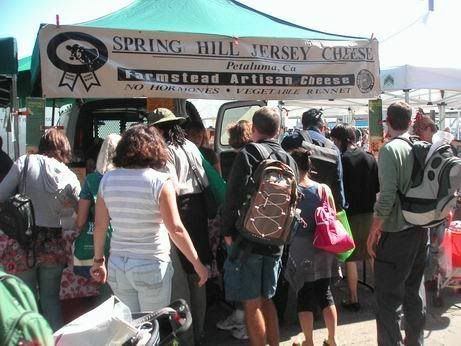 One of the vendors at many of our local farmers markets, is a wonderful organic cow dairy called Spring Hill Jersey Cheese. They are in Petaluma, less than 25 miles from where I live. We really are spoiled in California. I don’t know if you’ve ever met a Jersey cow before, but they are some of the sweetest beings on earth. My dad lived on a farm in Vermont decades ago and had an excruciatingly slow Jersey cow named Flash. She was practically the family pet. Growing up in Australia, a close family friend also had a pet Jersey cow named Velvet. Her family raised and sold Jersey cows, but Velvet was so sweet, our friend protested, fasted and kicked her feet until her mom agreed to keep Velvet. So, knowing that Jersey cows are so sweet, their milk just has to be as well. Marc’s family doesn’t eat animal rennet (a coagulant made from the inner lining of a calf’s 4th stomach, present in most cheeses), so we were pleased to see that only enzymes (copacetic for vegetarians) are used in all of Spring Hill’s cheeses. At Spring Hill, the cows eat grass, then their milk is taken to a cheese making room on the same property, and then aged, cut and packaged all right there. Very unusual in our modern factory-farming agri-business-global-society. Spring Hill doesn’t disappoint. We’ve bought their sharp sage cheddar several times, and boy does it disappear quick in this household. When we saw them at the Ferry Plaza market, they had a lot more variety than they bring to our Santa Rosa one. I tasted several cheeses but truly fell in love with their quark. I tried garlic, and enjoyed it, but came home with lemon. 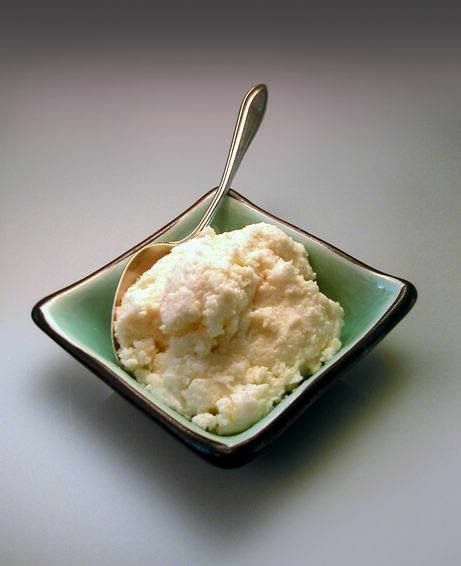 Quark is a smooth, somewhat grainy, unripened cheese with a tangy flavor and texture between cream cheese and ricotta. It is a common European cheese made with probiotic bacterial cultures (like yogurt) and is often used in cheesecake and breads. Spring Hill’s lemon quark is divine. So far, we’ve just spread it on whole wheat English muffins, and crackers, but it would make an awesome base for cheesecake. Also, tonight I put a dollop on my lentils with polenta, and it was absolutely delicious. I’m also considering making little puff pastry squares with some lemon quark and fresh fruit (like peaches or perhaps…even figs?). Marc saw that Spring Hill also had fresh churned butter in salted and unsalted. We had to buy it. I’ve never had fresh churned butter. It has a beautiful golden color, just asking to be featured in some amazing simple dish. As you can see by the photo, Spring Hill is a very popular vendor. It was hard to muscle my way in, I mean, politely wait my turn. The staff were very kind, answering questions, even though they were barraged by customers. They gave me a flier for their Great Peter Pumpkin Patch event during the whole month of October. They offer an experience of the farm atmosphere with: pick your own pumpkin, taste fresh made cheese, eat old fashioned ice cream, dig for potatoes and milk a cow. It’s from 9am to dusk Sept. 28 through October 31. I will just have to go. Yes, to know where my food comes from and meet the people who transform the Jersey cows’ milk into luxurious organic cheeses, but also because being on a farm brings out the kid in me. I fell in love with your lemon quark instantly and am sooooo sad that I can no longer find it. I miss lemon quark at the Sonoma Farmer’s Market. I am told that you don’t make it any more. Is that true? If you do make it, please tell me if you can send some to me or tell me where I could find it locally. I live in Sausalito. Thank you and I’m praying you still make it. Please let me know. Hi Margot ~ We are NOT Spring Hill Cheese Company, but only appreciators of their yummy cheeses. On their Facebook information page, quark is still listed as one of their products. Why don’t you contact them there and inquire.